Delicious, light, creamy, low carb, gluten-free crustless New York cheesecake! This cheesecake is so easy to make and it comes out perfect without a crust! Our comment section is full of praise for this recipe. Like these comments! Light delicious crustless cheesecake with berry sauce topping. Yum! The recipe I can trust to deliver a great baked New York Cheesecake without cracks in the top, is printed right on Raska’s cream cheese 3 lb. box. When I decided to try a crustless cheesecake, I followed Raska’s New York Cheesecake recipe, and sure enough, it came out beautifully. 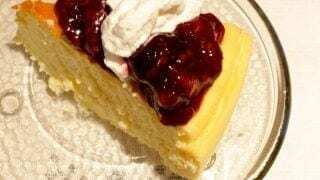 Watch the video in the Printable recipe card at the bottom of this post to see this New York Style cheesecake recipe made correctly. It offers TIPS to help you succeed. Cheesecakes are a family favorite for us. If you love them too, explore our Cheesecake section for some new ideas for cheesecake desserts. I’m always hunting up new recipes for cheesecakes. In fact, I just broke some new ground in cheesecake cooking. I now have an instant pot. The very first cheesecake I made in it I tried crustless and it WORKED!!! I made both crustless and crusted cheesecake in my instant pot. Go take a Look at my Instant Pot 6 Inch New York Style Cheesecake if you want a REALLY easy way to make a crustless cheesecake without cracking. It’s rich and creamy too. Baking your crustless cheesecake in the oven is what this post is all about. We have several tips and an instructional video with tips on successfully making this gluten free cheesecake with a KETO option too. Beautiful Crustless New York Cheesecake. Naturally gluten-free! Crustless New York Cheesecake has a velvety, creamy texture and that unique cheesecake flavor we all love. Without a crust; this is a pretty, gluten-free, light dessert. The whole thing is just one solidified step up from eating custard! Top it any way you prefer. Cheesecake is so versatile! The original Raska’s New York cheesecake recipe calls for a crust and gives directions on making one. I reprinted only the cheesecake filling with no crust. Because crustless is what this post is all about! I’m pretty excited that cheesecake can be made successfully without a crust. Suddenly it’s gluten free and lighter in calories. And a beautiful low carb cheesecake recipe. That heavy, rich dessert lightens up to a movie night snack! If you’re a devoted gluten-free and crusty cheesecake fan go take a look at my Chocolate Raspberry cheesecake. It has a gluten free crust “to die for”! You can use that crust to make a gluten free cheesecake recipe if you prefer. For the topping to this cheesecake as Pictured. I used the Raspberry sauce recipe from my Raspberry cheesecake squares and substituted Frozen Three Berry Blend for the fresh Raspberries. The nice thing about a crustless cheesecake is the time to make the recipe shrinks since there is no crust to make and bake. This is a really easy cheesecake recipe to put together. PRO TIPS to make a great cheesecake: Watch the video in the recipe card to see this cheesecake made correctly. Do NOT overmix the eggs. Egg proteins are delicate. For the best textured cheesecake add the eggs in at the end of the mixing one at a time and mix gently on low speed until just combined. USE this WATER BATH METHOD when oven baking any cheesecake to avoid the cracking problems cheesecakes often have. Just whip the few ingredients up in the mixer, pour it into your prepared springform pan and bake it in a water bath. Let the cheesecake sit in the oven after the timer goes off. I crack the oven door and insert a wooden spoon so the heat can slowly escape. Turn off the oven and let it sit in there about 45 minutes. The water bath and slow cool down help eliminate the cracking problems. AND the falling problems. Even heat, during baking and cooling, seems to be the key to a successful cheesecake. Last time I made this recipe I forgot and took it out and set on the counter right after it was done. I put it back in right away but it still fell. So be careful about that! If you want a little higher cheesecake… try using an 8 inch pan and let it cook another 10 minutes. That is what Amanda did in the video and it worked great with the extra time. Remember the crust layer is missing so this crustless cheesecake will be a little lower in a 9 inch pan. Let me know how this recipe works out for you. Anytime I hear from you I’m having a great day. Especially if you have concerns, questions or if something needs changing, in your opinion. We are always ready to hear thoughtful opinions and suggestions on Homemade Food Junkie’s recipes. I have made this one numerous times and NO cracking. We absolutely love eating this low carb dessert crustless. The reduction in calories is huge! If you really want to go skinny try using non fat yogurt instead of sour cream like I did last time. Still tastes great! This recipe is Keto approved with one ingredient alteration. Simply replace the granulated sugar with granulated Stevia. The video discusses making this as a keto recipe with this one ingredient change. It’s so easy and SO good! 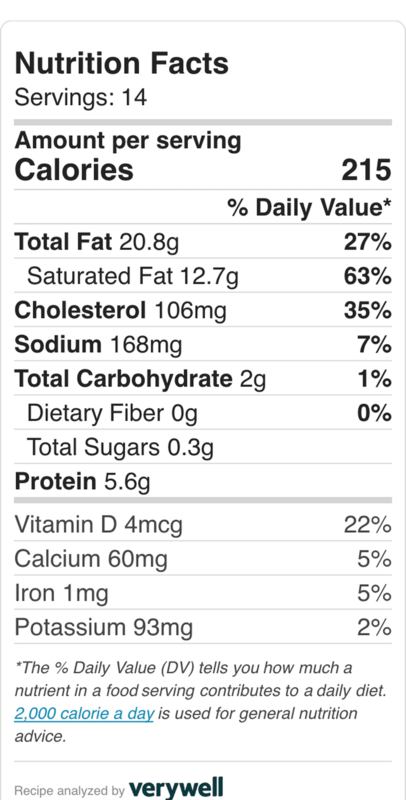 Look at our Nutrition Fact label with Stevia for the nutrition details. Delicious, light, creamy, low carb, gluten-free crustless New York cheesecake! This cheesecake is so easy to make and it comes out perfect without a crust! Wrap the outside of a 9 inch springform pan with heavy tinfoil to make it waterproof. In a stand mixer, beat the cream cheese. Add the sugar and mix. Add sour cream, scrape down the bowl as needed, and mix thoroughly. Crack the eggs and add in one at time, mixing after each addition. Mix in the remaining ingredients and mix until smooth. Pour the cheesecake batter into the pan and put the pan into a one/half inch water bath(I used my roasting pan). Bake for 75 to 90 minutes until set and golden brown. The top should NOT jiggle a LOT when set. But it may move a LITTLE BIT. Turn off oven and crack the door slightly for 30 minutes . Then remove cake to counter and let cool until the cake is at room temperature. Remove the sides of your pan and continue to cool in the refrigerator until completely set. Several hours. Cheesecake texture suffers if eggs are over mixed so be gentle with them. This water bath baking method and the long slow cool down in the oven are very important to get the results you see pictured. The chill time in the fridge (best if chilled overnight) is not factored into the recipe time as it's up to you how long to chill it. For the topping to this cheesecake as Pictured I used the Raspberry sauce recipe from my Raspberry cheesecake squares and substituted Frozen Three Berry Blend for the fresh Raspberries. This recipe would also be EXCELLENT topped with Roasted Raspberries! FOR KETO VERSION OF THIS RECIPE: Omit the sugar and replace with a KETO approved Sweetener. Calories in this recipe without sugar is 215 per slice. if you want more keto recipes go to Amanda's Youtube channel. She has partnered with us on several KETO recipes and her videos are great!! Hi! Interested in the fact that your instructions are to remove from pan after cooling to room temp, but other crust-less recipes instruct to have completely chilled before removing. Afraid my cheesecake might stick to the sides if I try to remove from pan too early! And be sure to oil your pan. use parchment in the bottom if you plan to remove the cheesecake for serving. Can I use just plain cream instead if sour cream? Hi Michelle, It’s going to make the cheesecake is unlikely to set properly if you use just plain cream to replace the sour cream. And it will affect the flavor. Greek yogurt is a good replacement for sour cream. The consistency is about the same and that bit of sour bite is still present. Glad to help. Please let us know how you like it. Have a great day! Hi Carol, Thank you for your feedback on this recipe. We are so glad it worked so well for you! Thank you also for mentioning you used Rapadura. What a fascinating combination with the swerve! It’s always helpful to learn new ways to get around refined sugars. Have a great day! Can I use Greek Yoghurt instead of sour cream in this recipe? Does any one know what the macros are per serving?? I am sorry you did not have the nutritional information you wish. 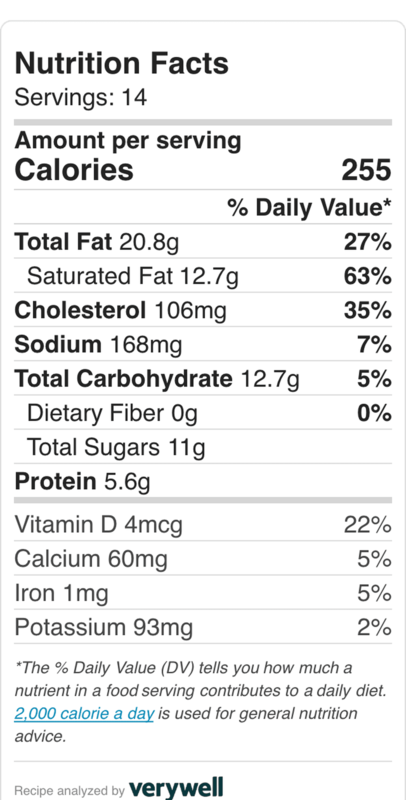 I have updated the recipe for you with two nutritional labels. One with sugar and one using stevia. I hope that helps. We recently upgraded our recipe card and this recipe somehow got stuck in the middle. Thank you for asking for help! Wow this cheesecake looks amazing! I’m not a big fan of the crust so this is perfect. Just wondering if it’s possible to half the recipe and bake in either an 8×8 square pan (for a short cheesecake) or maybe a loaf pan? I basically want to half the recipe (as I’m really the only cheesecake eater in the family haha!) but I’m unsure of what pan to use. Any advice would be much appreciated. Thanks! Hi Alyssa, I have a solution for you. Our Instant Pot six inch New York Style cheesecake. It’s delicious and well tested if you have an instant pot. It will work fine as crustless too. But it is NOT gluten free if you need that. You can also just halve this gluten free oven method recipe and use a six inch cheesecake pan. You can use any pan that it fits into but it might rise best and look more like a cheesecake in a cheesecake pan. Good luck and have a great week! 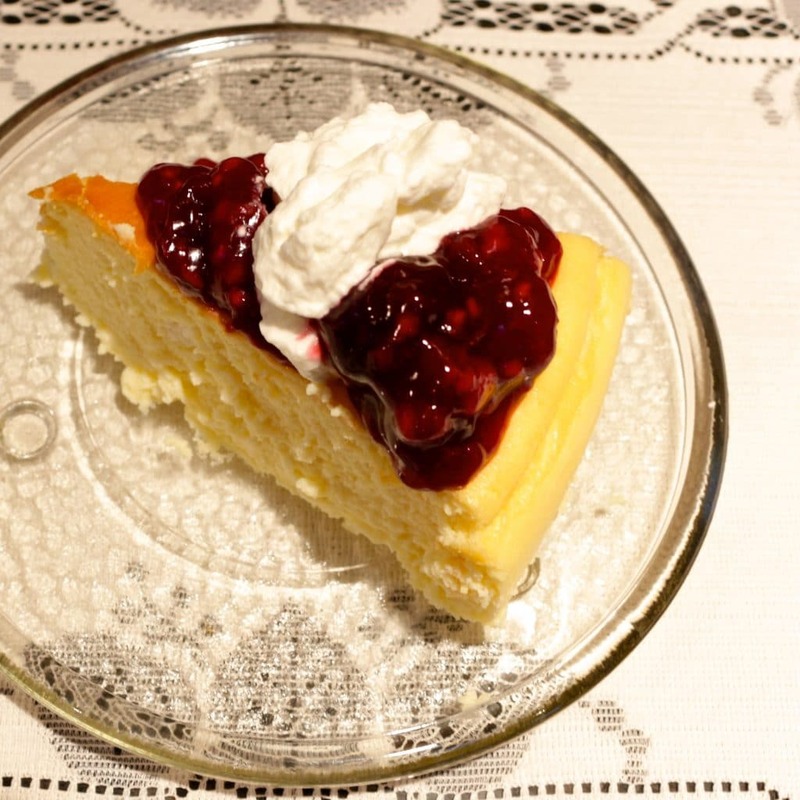 Hi Linda, One of our readers successfully used swerve as a sugar substitute for this cheesecake. She wanted a low carb result. She said it turned out great! Let us know how it goes for you and what you choose to use in this recipe. Thanks and have a great day! WHERE IN THE HECK IS THE DARN RECIPE!!!!??????????? GOSH THIS IS FRUSTRATING! I FOUND THE VIDEO BUT THERE IS NO INGREDIENT AMOUNTS TO BE FOUND ANYWHERE! HOW THEY HECK ARE YOU ALL MAKING THIS RECIPE WHEN THERE IS NO RECIPE!!!!!!!!!!????????????????????????????????????? Hi Dennis, I am SO sorry. We are beta testing a new recipe card and it’s having some issues. for now, I have restored the old recipe card for you. THANK YOU for letting us know this happened! Enjoy your cheesecake! I can’t wait to taste it once it cools! I followed the directions and it seems very low in height. I know it’s missing the crust but with 3 boxes of cream cheese seems like it should be higher not sure where it went wrong but hopeful it will taste delicious. Hi Lisa, I’m not sure how low it is but it could be a mixing issue. No worries. If you have the recipe correct it should taste great. Please let us know and thanks for sharing your experience with us! 16 oz Glass Jars – DON’T DO IT! Good luck! Please let us know how it goes for you! This is a great recipe! I thought my mom’s was good, but this superior to hers with 1/3 of the ingredients. My husband really liked it’ as well. This will be my recipe from now on. Thank you for sharing! Hi Carrie, I’m delighted you enjoyed it. Thank you so much for the stellar rating and kind remarks. Have a great day! Hi Diane: I want to make this in 8oz mason jars. Would the time in the oven still be the same? Thank you! I have never made this in 8 oz. mason jars but I’m sure it will work great. I found this recipe link for you from Allrecipes. It does use a crust but the baking instructions should be pretty close. Here are the instructions:“Pour the cream cheese mixture into the muffin cups, filling each until 3/4 full. Bake at 325 degrees F (165 degrees C) for 25 minutes. Cool completely in pan before removing. Refrigerate until ready to serve.” I hope this helps. I’d love to know how this recipe turns out in the small servings. Have a great day! A coworker of mine is retiring and asked me to make him a cheesecake. He stated that he is not crazy about the graham cracker crust but he would take it. I ran across your crustless cheesecake and realized this is what he wants. I am currently cooking a trial one and I pray it turns out as delicious as the previous comments. Will keep you posted. Yes, the cheesecake was DELISH!!! I didn’t change a thing but now I have to do the real thing. I did grease the pan but it was still a little difficult to remove from the bottom of the springform pan. For the real deal, I am putting parchment paper on the bottom so I can slide it off and into a box once completely set. Whoever said the crust makes the cheesecake has not tried this one!!! Thanks for the recipe and this is definitely a keeper!!!! Oh yay! I’m so happy you came back to let me know. Thank you! This looks like a great cheesecake I’d like to try. However, I’m grain free but also sugar free. Has anyone tried this with a sweetener such as Swerve or Xylitol or any of the “better” sweeteners? One of our readers, Sharon left The comment(partially copied for you below) on the post. Apparently Swerve works as a sugar substitute in this recipe. I’d love you to share how it turns out for you. Please let us know what amount of swerve you use and how the cheesecake texture turns out. Thank you and Have a great day! The cheesecake turned out great, regardless that i forgot to grease my pan. It’s all about the taste, and it tasted great. DH and I both liked the cheesecake with, and without, the three berry (raspberry, blueberry, blackberry) compote. To make it low carb i used swerve instead of sugar. Now instead of a donut for breakfast, let’s have cheesecake! Thank you so much for giving us an easy and tasty dessert, with so many variations. Hi Sherry, That’s great to hear. Making it sugar free is a great idea. Talk about low carb yummy! Thanks for sharing and Happy Easter! Wondering if this cheesecake freezes well? Hi Lorraine, This cheesecake freezes just fine. I freeze cheesecakes often and they are so nice after. Just remove it from the freezer and set it in the fridge for several hours or overnight. You can also refreeze cheesecake tightly wrapped. Such a handy dessert. Thanks so much for the question. Happy Holidays! I LOVE this but think it needs some salt, how much would you recommend? Hi Stephanie, Thank you for your comment and rating this recipe. If you wish to salt this cheesecake start with 1/2 tsp. and go up in tiny increments until you are satisfied. Also you could put a salted caramel topping on it add some pizzazz. Let us know the amount you add in. Our other readers may benefit from that. Thanks again! My husband said this was the best cheesecake he has ever eaten. He thinks I am a cheesecake wizard! Thanks for the recipe. Hi Ems, It’s one of our favorites too. Lol. I really appreciate your reviewing this recipe for us. So glad it made you a cheesecake Wizard! Have a great day. Hi Soe, I’m so happy you love this cake! I think you made it even better with the fondant and genache. What a great dessert. Happy Birthday to your husband and thank you for sharing what you did and reviewing this cheesecake. Have a great day! Diane, I made this cheesecake yesterday. This is how I did it. Made the recipe exactly as written, but poured it into a butter greased round cake pan. baked it in a water bath for 75 minutes .Turned the oven off and then put the wooden spoon to vent the oven for thirty minutes.I cooled it for twenty minutes then put It in the fridge for four hours , then topped it with whipped cream. Did not remove it from the baking pan.This was the most wonderful crustless cheesecake ever.My family and guests just said it was the best. Thank you Diane. Hi Marie, Thank you for letting me know you had so much success with this recipe! You made my day. I’m so happy your guests and family loved it too. I really appreciate your comment. Hi! Just wondering if you have tried making this in muffin tins for individual servings? If so, would you still bake in water bath and for how long? Hi Liz, I have made a gluten free lemon cheesecake tart in small four inch tart pans. I have never made any cheesecake in muffin tins other than muffins filled with cheesecake like my Black Bottom Cupcakes. But it should work ok. If you look at the lemon tart recipe you’ll see the small crustless tarts fell. So I do recommend a water bath method with maybe a 1/3 of an inch of water under the muffin tins. AND keep them in the oven as directed too after baking with the door cracked. This recipe is very reliable so I think you will have good luck with it. I’m not sure how long to bake them but try 20 minutes and if they are just golden brown and pulling away from the GREASED muffin tins they should be done. Good luck! I’d love to know how they turn out for you and have a great Fourth of July! This recipe is awesome!! I followed the advice to leave it in the oven for 30 minutes after turning it off and it was a success! Mine baked for exactly 75 minutes. I love the texture, the flavor, everything! I hate cheesecake with a crust, its just too much for my taste, this recipe without a crust is light and so good, thank you so much! Hi Jessica, Thank you so much for your lovely comment. I’m so pleased it worked out for you. This Crustless cheesecake is a fun lighter dessert. Our readers will really benefit from your experience. Have a great day! Hi looks amazing how do you make the berry compote/topping? Hi Kathy, I used a version of my homemade raspberry sauce for the topping you see. Instead of raspberries I had a bag of frozen mixed berries I made into a thick sauce for the topping. My blueberry sauce with maple syrup or any berry sauce you prefer will be wonderful with this. Have a great day! The BEST cheesecake I have ever tasted!!! Thank you! what do you mean by an ice bath?? Surround the springform pan with tinfoil to keep the pan water tight, crimp the tinfoil over the pan top lip a bit to keep it tight. Now immerse the springform pan in a deep pan (I use my oven roasting pan) with a 1/2 inch or so of water in it. Put this large pan with the cheesecake in it into your preheated oven. Bake as directed. The water bath steams the cheesecake while it bakes which helps the cheesecake bake more evenly and crack less. Good luck.Thank you for asking me to clear this up! I just put this in the oven but the tinfoil fell on one side of the pan!!! What are the chances water will get in the pan?? I’m not sure but some might. If you can take it out and crimp the tinfoil over the pan sides that should keep the tinfoil up. Let us know how it turns out. Fingers crossed! My better half says that his favorite cake is cheesecake; so much so that it’s what I make for his birthday. I usually go with a brownie crust, but he stated this year that what he *really* wanted was an “all-cheesecake” cheesecake and thanks to your recipe, it was a possibility!! Admittedly, I am completely self taught and have made quite a few rookie mistakes in the past;, including puling cheesecakes from the oven as soon as the baking time is completed. Sure, they taste delicious, but the cracks and collapsed centers have left me disappointed. However, after research and finding your page, I’ve used a water bath and as I’m typing this, I’m still at the wooden spoon propping the oven door open stage(which I must say is brilliant)….but it looks lovely and I’m hopeful it won’t crack. Thank you so much for a recipe with thorough directions!! I made this tonight to celebrate my gluten-free daughter’s homecoming after 2 months. Yummy and light (not a dense cheesecake, but delicious nonetheless). Very easy to make. I didn’t need to bake it 75 minutes, though. This is the most unintimidating recipe. I’ve got the ingredients, and have printed out the recipe. I will be making this tonight…its on my low carb high fat diet. Yay me. I’ve already have compote made to dollop on top. Hi Sharon, We LOVE this, simple to make, crustless cheesecake. I also appreciate a creamy dessert without all the carbs. I’ve made this recipe several times. It’s pretty bullet proof. I’d love to know what your compote is and how you like this dessert when you try it! We are always looking for inspiration. THANK YOU so much for stopping by with your comment. Enjoy!! I haven’t used Swerve or a three berry compote, I’ll try them! Great tips on getting this cheesecake down to fighting fit! Cheesecake for breakfast could become a favorite! Have a great day. You certainly gave mine a boost! That is a big gap between possible baking times…how would you know if it was done? I love cheesecake in ANY way. I’m not usually one to make too many sweets, but I’ve been wanting to make a cheesecake for a while now. Will definitely have to try this out, since it seems so simple and looks SO perfect! I have never made a crustless cheesecake before, sounds and looks delicious I will have to try it. Rosemary, Let me know what you think when you make it. We love it! So light and delicious! Crust or no crust, this cheesecake looks delicious!! Oh I could totally go for a slice right now. I love cheesecake. It is my weakness! Mine too Meghan. This one is so easy! And so tasty! I think those stripes look delicious!! What a beautiful cheesecake. I usually have to cover the cracks with some sort of topping. This is brilliant! Thank you so much for taking the time to write to us Nicky! I love this crustless cheesecake too. I’m delighted to hear your family is making use of this recipe and enjoying it! Happiest of Birthdays To your daughter! Merry Christmas to you and your family.I really appreciate you letting us know it’s working so well for you!! Hi Milo, The recipe includes all the necessary ingredients. I can see the extra empty bullet points in the recipe that may have confused you. So I went ahead and deleted the extra spaces. I’m so sorry for the cnonfusion they caused. I’m delighted you are planning to make this! Please let me know how it turns out for you. I have had very good luck with Raska brand cream cheese and this recipe! Crustless?! But the crust is the best part! Or is it the cheesecake… lol I am going to have to try this. Cheesecake is cheesecake no matter what! Pinning! Thanks for sharing this at Totally Terrific Tuesday last week. I can’t wait to see what you have lined up this week. I had no idea cheesecake was this easy. My springpan broke so I’m gonna order one online. I have to make this for Guvor & Inger! Thanks for the great post. Your photos are awesome! Thanks for the compliment Susie! This is a really easy recipe. Hope they Love it as much as we do! This crustless cheeesecake looks delicious. By not eating the crust we are saving so many calories! I have to make your recipe! Thank you for sharing!! Wonderful Hadia! Thank you for stopping by. Hope you let me know how you like it. We love this easy,light, gluten free cheesecake!